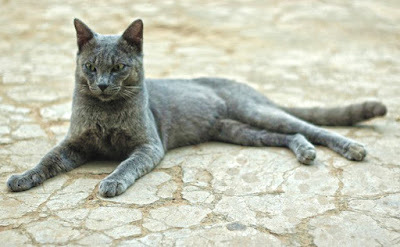 The Raas cat is endemic of domestic cat breed originating from Raas Island, Indonesia. Raas is believed locals can bring good luck and abundance of fortune. They also believe that raas has a sixth sense and can only be maintained by certain people, such as kyai, officials, and community leaders. They believe that Shaykh Kholil's cat was the Raas breed. Based on the story of the locals, he once kept two blue and brown kittens, and when he died, the cats that he kept were also disappeared. Thus, many Raas cats are found at the Madrasas in the Madura region. If Raas was taken out of the island on a boat by an unmarried man, people believe it may able to make the boat sink. People also believe that if the cat has taken out of the island, then the person who brought it will has misfortune. The Raas breed has physical characteristics similar to leopards and bobcats. The body size is larger than the average house cat. Its tail has a medium length and bent at the end. The Raas has dark green, oval-shaped eyes which are not overly wide. Its face is squarish, with a slightly tapered chin. The ears are triangular.